I recently had the privilege of working on a voice over segment for charity organisation Open Doors’ Walk to Water campaign on September 10, 2011. 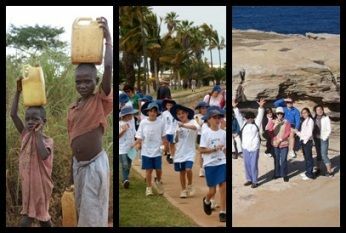 The campaign encourages local Australians to gather together and walk to their nearest water supply, to raise funds for deep water boreholes being built in Northern Nigerian villages that have no access to clean drinking water. My first read through the script took me by surprise. The accompanying movie clip features the classic images we’ve seen so many times – dirty children carrying buckets; a mother with baby on hip and water tank on head; cholera ridden faces and that overriding despair. And yet, it got me. Why is this still happening? How long have we known about this? And in our fast-shrinking, technologically advanced world, how can we forget? We switch the TV off, make ourselves a nice cup of tea and snuggle up in a bed with electric blankets. Even if we’re doing it tough and life is a struggle, (which is the truth for so many in Sydney, with soaring living expenses and dysfunctional relationships running rife), it still seems to pale in comparison to what our third world brothers and sisters face. Why is it that some of us have water running through our fingertips, and others are dying for it? It’s not as if those people chose to be born into that family, in that village, in Northern Nigeria. I didn’t get to choose my parents either. But what do we do with our privileges? A first world free country, with that most basic commodity – clean drinking water running down our drains as if it’ll never run out. Even the local playground has water fountains on hand. It’s enough to make those Nigerians green with envy – or perhaps I should say, rosy with health. So what can we do? It’s not always practical to go over there to dig a well ourselves. I have a small daughter, a mortgage to pay – and besides, would the money for my flights be better spent on the project itself, rather than some enthusiastic white girl showing up in Northern Nigeria with a shovel?! Yes, we should sponsor children, give to charities and help out at local events. Apparently, the average Northern Nigerian walks 8kms to find water. (Just imagine how that would mess with your daily schedule: To Do Today: 1. Find water. 2. Walk back. 3. So thirsty from the walk – drink…) Skip your gym class on Sept 10 and kill two birds with one stone (and you could donate your class cost to sponsoring a friend to go with you while you’re at it). To find out more, visit www.opendoors.org.au. You can make a difference. On a cold and rainy weekend, one of the bands that were warming crowds up at the Darling Harbor Jazz Festival 2011 was Dale Barlow and his wonderful band, consisting of Jonathan Zwartz on upright bass, John Harkins on keys and Hamish Stuart on Drums. First, the smooth grooves set by Hamish and Jonathan held an instant appeal, drawing the crowd despite the freezing weather. The experience, skill and dexterity of their playing around Barlow’s performance set the ground for a formidable display of australian talent. One of Sydney’s premier drummers, Hamish Stuart is always a pleasure to listen to – and of course also an incredible privilege to have had perform with the Charlotte Jane band on previous occasions. John Harkins, one of Sydney’s finest jazz pianists was as nimble as ever, weaving luscious sounds throughout the arrangements with stellar solos and hot grooves, not at all hindered by the cold. The band did several standards, as well as a selection of originals to keep the musically educated crowd very satisfied. Sadly, it seemed the festival overall had low attendance, with many punters put off by the poor weather. 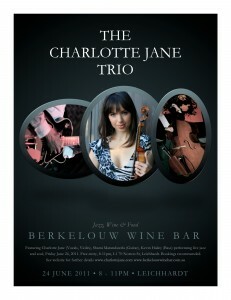 However, for the committed, there was a fine range of local and international jazz talent on display. 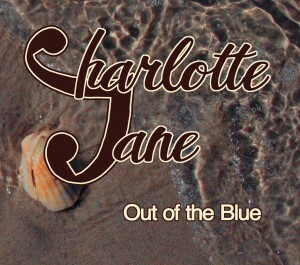 Frank Presley reviews “Out of the Blue” and “The Charlotte Jane Band”. Debut EP ‘Out of the Blue’ available now. Purchase online through CD Baby or itunes, or Contact Us for your own copy. Charlotte Jane has it all: charisma, true talent, discipline, openness and that elusive yet all-important X-factor.’ – Kate Ward Smythe, Artistic Producer.